Click on any of the labels to see more information about the buildings of the middle court. 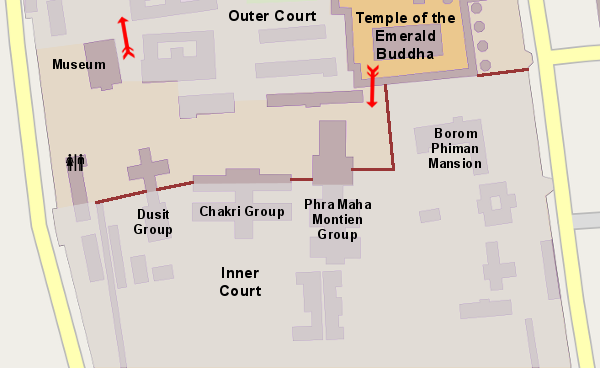 The exit from the Temple of the Emerald Buddha brings you directly into the Central Court of the Grand Palace. This is where the king's audience halls, where he met the people and conducted the business of state, are located. The first building you will see is also the newest, the very European styled Phra Thinang Boromphiman, built in 1897 by King Rama V for his son. The mansion is never open to the public. Next to the mansion is the oldest building in the palace, the Phra Maha Monthien group. The throne hall with its magnificent golden palanquin backed by a boat-shaped pulpit is open to the public on weekdays only. Several other interesting buildings and pavilions surround the throne hall. Right in the middle of the complex, and dominating it, is the Chakri Maha Prasat hall, sometimes called the "foreigner with a Thai hat" due to its mixture of styles. The building is still used for state occassions, so it isn't open to visitors. However, there is a small display of ancient armory in the base of the building. West of the Chakri Maha Prasat is the Dusit Maha Prasat group, perhaps the most elegant of the throne halls. On the outer wall of the Dusit Maha Prasat, Rama IV built the Aphornphimok Pavilion, where royal guests would be delivered or taken away on palanquins. Facing the Dusit Maha Prasat is a building now housing the Museum of the Temple of the Emerald Buddha. You can exit the palace via the gate next to the museum.